All our designs can be adapted to create your customised pen with your own special message. Our experienced design team is at your service. 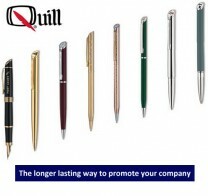 Exclusive Distributors in Ireland of Quill World Class Writing Instruments. Standard Two Piece Gift Box OR Presentation Card supplied with envelopes Optional Extras: Deluxe hinged gift boxes Individual names (laser engraved) Customised packaging (see below) Duraprint - durable printing on barrell *All Quill pens are precision made and unquestionably guaranteed against mechanical failure regardless of the age Contact us for our full range or to request a catalogue. Adding Logos - Get Your Message Out There! Put your name where it matters most - into your clients hand! Add your logo to any of our pens. Great range of quality pens to chose from. Please send an enquiry for more information.